Many will be familiar with the television series Call the Midwife based on the life and books by Jennifer Worth. 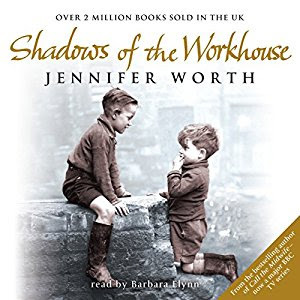 In Shadows of the Workhouse, Worth relates particular stories from people she met who spent time in the London workhouses of the 1950s. They are an interesting and important account of life and attitudes of the time that was not all that long ago and must not be forgotten. While it highlights the poverty, suffering and hardships of the people, it also tells of their resilience, faith and humour. It is beautifully written with tenderness and caring of the people she encountered without being overly depressing. The week before Christmas, 1929, Eoghan O'Keenan loses his factory job, and has to flee the slums of Chippendale with his seven-year-old sister Agnes. On the north side of Sydney at Lavender Bay, Olivia Greene is working on her latest millinery creations and dreaming of becoming the next Coco Chanel. A job on the Harbour Bridge for Eoghan, designing couture for the Governor's wife for Olivia, and a chance meeting in the Botanic Gardens sees the beginning of an unconventional romance. From vastly different backgrounds, with absolutely nothing in common - from faith to wealth and class - it seems that the blue mile of harbour between Olivia and Eoghan will be the least of the obstacles ahead. By mid-1932, as the construction of the Bridge is completed, the city is in chaos as the Great Depression begins to bite hard and the unemployed edge ever closer to a violent revolt. And then Eoghan disappears. 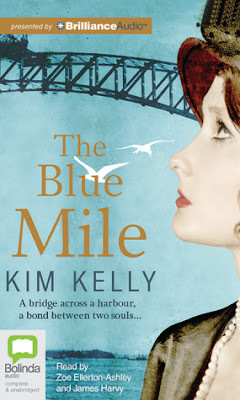 Set against the spectacular backdrop of Sydney Harbour, The Blue Mile is a tale of the both wild and calculated risks a city took to build a wonder of the world, and of those taken by ordinary people to save a great love, against all of the odds. I borrowed the audio book of The Blue Mile from my local library. I was looking for material to give me a ‘feel’ for Sydney during the Great Depression as research for my current book. Although it is a fictional story line the backdrop of hardship, politics of the day and the building of the Sydney Harbour Bridge are based on facts. The reason I chose the audio book was to make use of my time driving to and from work – trying to cram in as much research as possible. I was already fairly familiar with the history of the time but still learnt a great deal. As insight into the era and the building of a major landmark it is accurate and absorbing. The Sydney Harbour is itself a link between the two characters. It provides work for Eoghan when finding a job was difficult and inspiration for Olivia’s fashion designs. 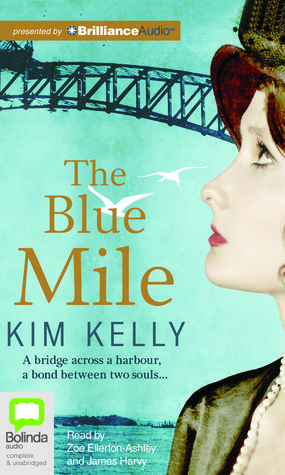 The blue mile refers to the stretch of water in Sydney Harbour between the suburbs where the two characters, Eoghan O Keenan and Olivia Greene, live. A world apart in relation to background, financial security and class. As a love story, it is enchanting. The characters are believable and, although they come from different class backgrounds, are well matched. Little Agnes is a delightful child who has a very grown up attitude to life. The audio book is narrated by Zoe Ellerton-Ashley and James Harvy. Both of these Australian actors brought their characters to life as well as that of Agnes. James’ Irish accent was delightful to listen to. I loved the story and its audio presentation and often wished my trip to work was longer so I could keep listening. I am not a reader of love stories but Miss Kelly has delivered a well-researched historical fiction/love story with characters I enjoyed immensely. It had me totally engrossed. I intend to follow up with reading more of her books. I am using the author’s own precis. It is not only a good summary of the story line, it is also a good indication of the suspense the reader can expect and how well Freeman writes in this style. With the window closing fast, Farr must race the clock to rescue his love…or be consumed by the madness and violence he had thought left behind. If you enjoy shows about criminal profilers like Criminal Minds then you are sure to enjoy The Extraction. Farr hasn’t used his profiling skills for three years but his former FBI profiling partner helps him solve the riddles. Nothing is left for the reader to imagine. The scenery, actions and emotions are highly descriptive and have the reader spellbound. The characters are well developed and likeable (well the goodies are). 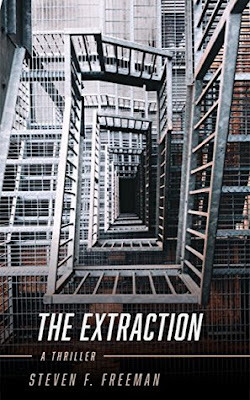 The Extraction is an enthralling mystery thriller, full of suspense that has you guessing a new outcome with every chapter, but you will never guess the ending. I have read several books by Steven F Freeman, all good but this is one of his best to date.